Hi everyone! I hope you're having a wonderful week so far! 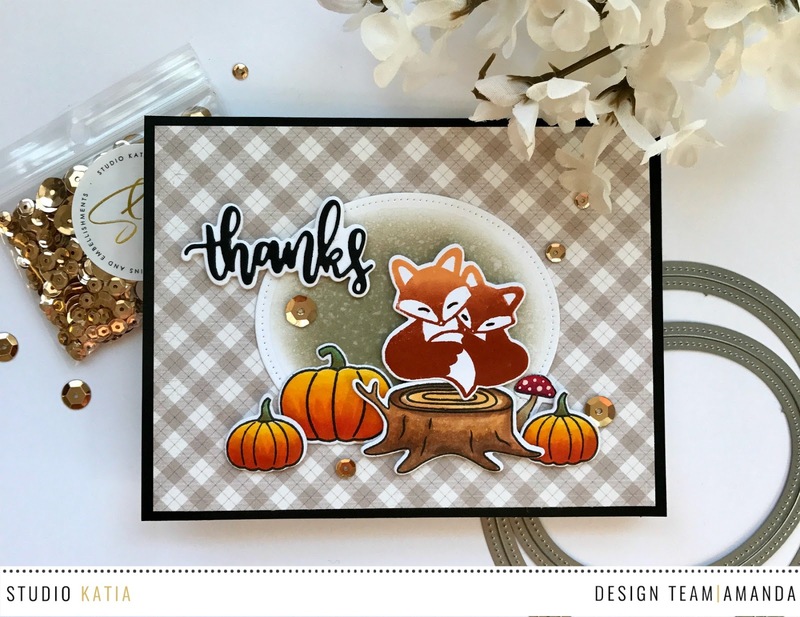 Today I'm up on the Studio Katia blog with a Fall/Thank You Themed card. I've combined images and sentiments from 3 different stamp/die sets to create my scene. I started by inking the hugging fox from the Foxes stamp and die set in 2 different colors. A peach for the top of their heads and a rust for their bodies. This gives the image a little highlight. I colored in the closed eye with a black pen to make their eyes stand out a bit more. I also stamped, colored and cut the tree trunk and mushroom from the same Foxes set. Thanks for joining me today, I hope you've enjoyed my project for this Fall/Thank You themed week over at Studio Katia! This card is so adorable !